Samsung Electronics, today announced the Galaxy S7 edge Injustice Edition in collaboration with Warner Bros. Interactive Entertainment and DC Entertainment. 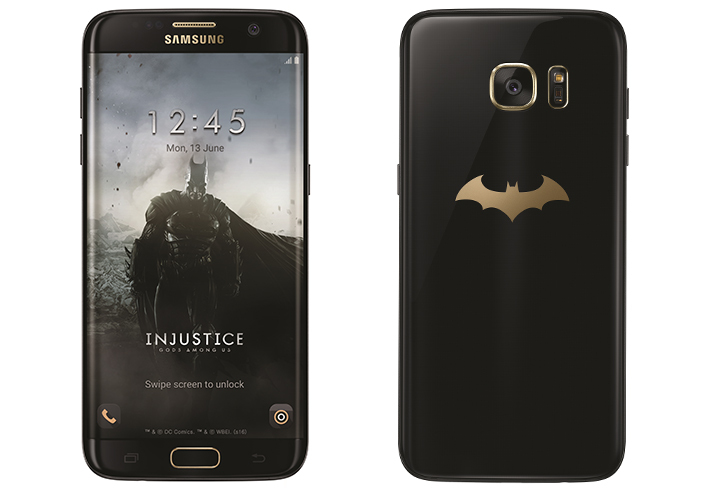 To commemorate the third anniversary of the popular mobile game, Injustice: Gods Among Us, the companies came together to bring Samsung’s technology and one of the game’s central characters, Batman, in a sleek, high-performance smartphone. The limited edition Galaxy S7 edge Injustice Edition will be available in early June exclusively in select territories, including China, Singapore, Korea, Latin America, Russia and others to be announced soon. With enhanced hardware and software capability, and bigger battery capacity ensuring long play time, the Samsung Galaxy S7 edge is optimized for the best gaming experience, fueling a natural partnership between the two brands. Developed from the ground up by award-winning NetherRealm Studios, the Injustice: Gods Among Us mobile game delivers stunning graphics and a completely unique fighting gameplay experience. The game features a collectible card mechanic and engages players in 3-on-3 tag team combat that features many of DC’s most iconic characters. The Injustice: Gods Among Us game is available as a free download on Google Play. Full details and product images are available at www.samsungmobilepress.com or http://www.samsung.com/global/galaxy/events/injustice. NetherRealm Studios is a leader in the development of interactive entertainment, and the creator of the billion dollar Mortal Kombat franchise. Mortal Kombat has spawned two theatrical films, multiple television series, and has sold over 42 million games to date. Located in Chicago, Illinois the award-winning NetherRealm team has been working and creating games together since 1992. Additional information about NetherRealm Studios can be found at www.netherrealm.com. INJUSTICE: GODS AMONG US © 2016 Warner Bros. Entertainment Inc. Developed by NetherRealm Studios. All other trademarks and copyrights are the property of their respective owners. All rights reserved. DC LOGO, and all characters, their distinctive likenesses, and related elements are trademarks of DC Comics © 2016. WB SHIELD: ™ & © Warner Bros. Entertainment Inc.